, the European particle physics laboratory based in the suburbs of Geneva, some of the world’s best physicists and engineers are using advanced particle accelerators to help solve age old questions about the universe — What is is made of? How did it start? We’re delighted that CERN opened its doors to Google Maps Street View allowing anyone, anywhere in the world to take a peek into its laboratories, control centers and its myriad underground tunnels housing cutting-edge experiments. Street View also lets scientists working on the experiments, who may be on the other side of the world, explore the equipment they're using. This is the Large Hadron Collider. The LHC beauty experiment will shed light on why we live in a universe that appears to be composed almost entirely of matter, but no antimatter. Learn more here. This is the the 7000-tonne ATLAS detector. From a cavern 100 metres below a small Swiss village, it’s probing for fundamental particles including the Higgs Boson. ALICE is a heavy-ion detector on the Large Hadron Collider ring. It's designed to study the physics of strongly interacting matter at extreme energy densities, where a phase of matter called quark-gluon plasma forms. The Compact Muon Solenoid (CMS) is a general-purpose detector at the Large Hadron Collider. It's designed to investigate a wide range of physics, including the search for the Higgs boson, extra dimensions, and particles that could make up dark matter. 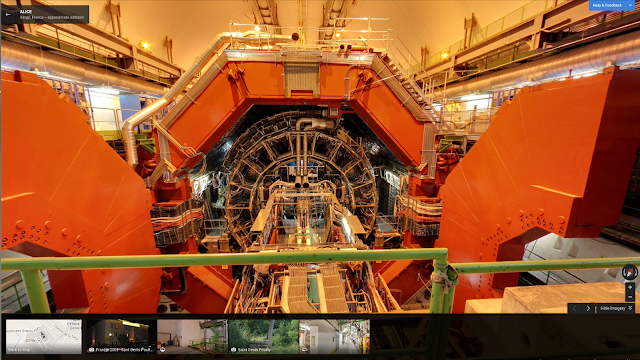 For two full weeks back in 2011, members of our Street View team from Google’s Zurich office worked with our CERN partners to capture this incredible imagery. 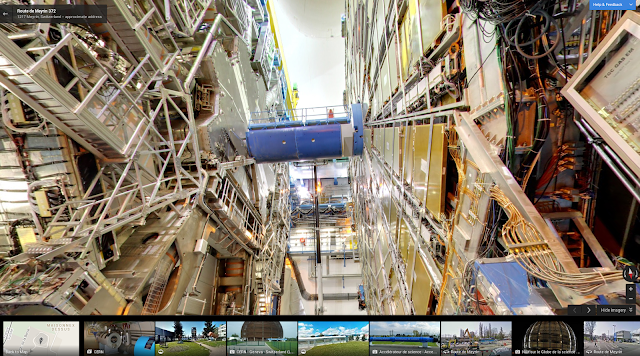 You can check out the above experiments, like ATLAS, ALICE, CMS, LHCb and the Large Hadron Collider tunnel in Google Maps, as well as collections of other Street View imagery from amazing sites around the world, on our Views site. 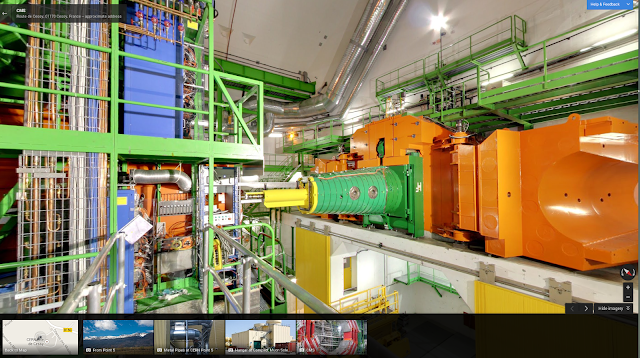 You can also learn more about CERN by following its Google+ page. At CERN, the European particle physics laboratory based in the suburbs of Geneva, some of the world’s best physicists and engineers are using advanced particle accelerators to help solve age old questions about the universe — What is is made of? How did it start? From time to time we invite guests to post about subjects of interest and today we’re pleased to share a post from Guy Willoughby, Executive Director of the HALO Trust, a U.K.-based nonprofit dedicated to landmine clearance in post-conflict areas. Hear how HALO is using Google Maps for Business to fight the war against mines, clearing more than 1.4 million landmines worldwide. -Ed. The information we gather, including GPS references to landmines in the field, is imported into Earth Pro so that we can plot mine locations. We also use the incredibly detailed satellite imagery in Google Earth to identify and map hazardous areas. These high-resolution maps serve many people: from families who live near mines, to crews who clear them, and donors and other organizations that support us. When donors view the vivid interactive maps of our project areas—with mines so close to schools, farms and houses—they understand why the HALO Trust’s work is so critical. 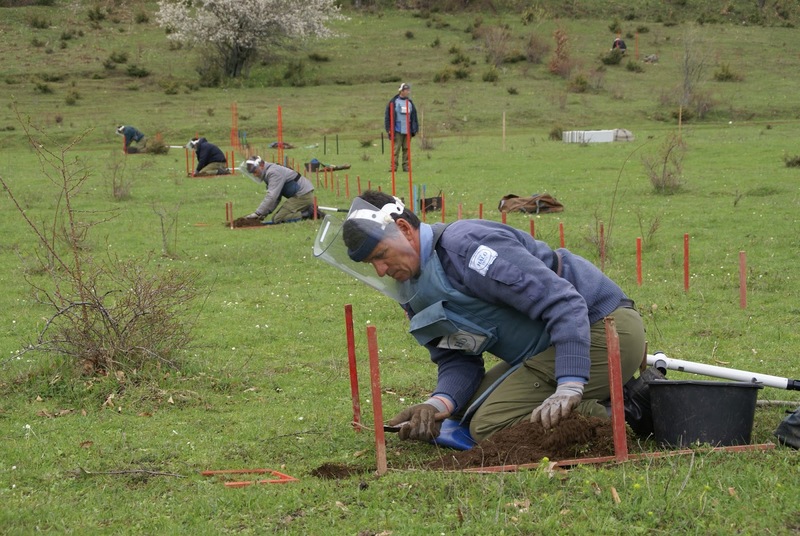 Learn more about HALO’s work in Kosovo. , in partnership with the Directorate of the Galapagos National Park and Charles Darwin Foundation, we’re launching the 360-degree images from the Galapagos Islands that we collected in May with the Street View Trekker. Now, you can visit the islands from anywhere you may be, and see many of the animals that Darwin experienced on his historic and groundbreaking journey in 1835. The extensive Street View imagery of the Galapagos Islands will not only allow armchair travellers to experiences the islands from their desktop computer, but it will also play an instrumental role in the ongoing research of the environment, conservation, animal migration patterns, and the impact of tourism on the islands. One way in which the Charles Darwin Foundation plans to use the Street View imagery for science is by allowing the public to help identify plants and animals observed when navigating through the imagery. 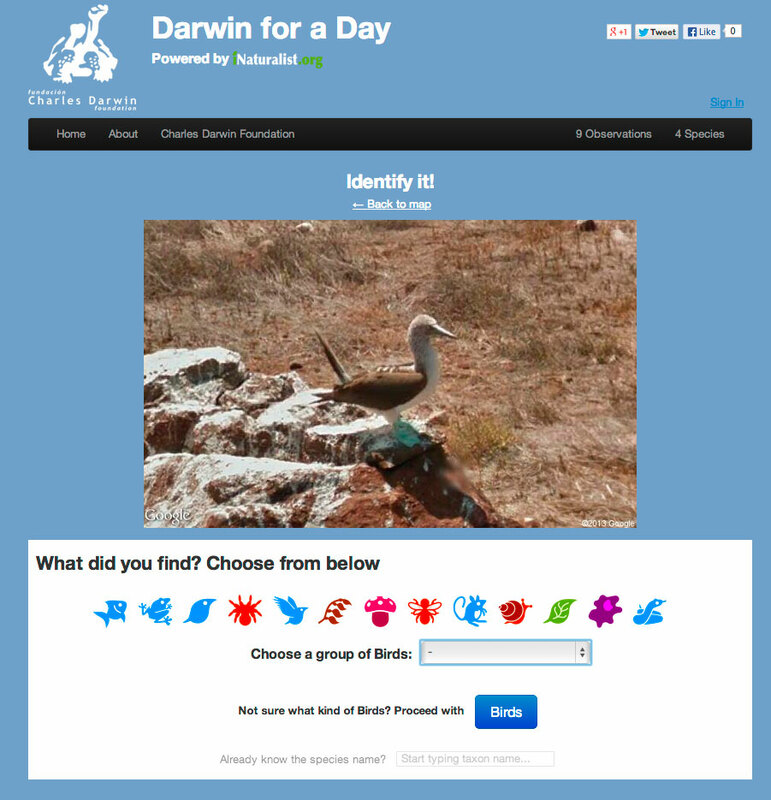 Together, Charles Darwin Foundation and iNaturalist - a website and community for citizen scientists - have developed a new project they are excited to launch today: Darwin for a Day. 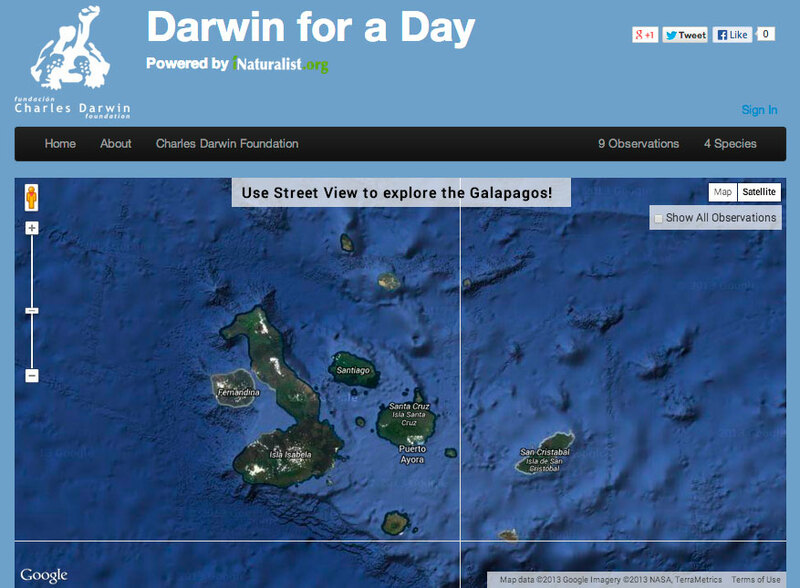 Using Darwin for a Day, you can explore Street View imagery in the Galapagos. 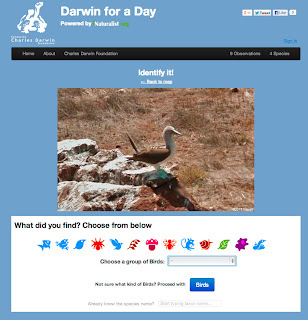 Navigate through Street View, and choose an animal or plant you’d like to help identify! 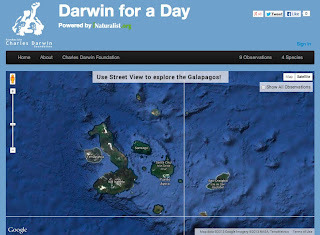 Darwin for a Day is a web application that invites you to step into Darwin’s shoes by exploring the Galapagos Islands through Google Street View and document its unique plants and animals. When you see an animal or plant you’d like to catalogue, you can describe it by creating an observation. You can just enter your best guess as to what it is - for example, “bird” - or enter in the scientific name, if you know it! All of your observations will be shared with the iNaturalist community & the Charles Darwin Foundation, and will contribute to research of the Galapagos Islands. Visit our behind-the-scenes experience and tune in to an exclusive Google+ Hangout with the Google Maps team and our partners at 9:00 AM PT today to learn more about this special collection of imagery. Today, in partnership with the Directorate of the Galapagos National Park and Charles Darwin Foundation, we’re launching the 360-degree images from the Galapagos Islands that we collected in May with the Street View Trekker. Now, you can visit the islands from anywhere you may be, and see many of the animals that Darwin experienced on his historic and groundbreaking journey in 1835.
an initiative using Street View to digitally archive the 2011 tsunami and earthquake-affected areas in Northeastern Japan. Since then, we’ve captured 360-degree panoramas of the region, including the town of Namie-machi in the Fukushima Exclusion Zone and over 70 interiors of devastated buildings across the Tohoku region. Our digital archiving project aims not only to make a record of the disaster’s wreckage, but also to illustrate the process of Japan’s recovery. Towards that goal, we’ve driven our Street View cars throughout the Tohoku region again over the past months. Today we are updating the Street View imagery for 17 cities within the Iwate and Miyagi Prefectures for the first time since we published the first panoramas back in 2011. By releasing this new imagery on Google Maps, we hope people in Japan and from all around the world can virtually explore what these towns currently look like and better understand how local governments are working on rebuilding residents’ homes and lives. We recognize that the previously collected imagery has emotional and documentary value, so we’re going to continue making this imagery available to users on our Memories of the Future site. Starting today, people will be able to see 360-degree images of what these cities within the Tohoku region looked like before the tsunami and right after the tsunami, as well as what they look like today. We are also publishing imagery today of new areas within the Fukushima Exclusion Zone, including the abandoned towns Ōkuma and Futaba. This includes roads near the Fukushima Daiichi Nuclear Plant, and in the new imagery, you can see the entrance to the plant on Street View. In just two years, the affected areas in Northeastern Japan have already started to slowly improve and will continue to do so as the recovery continues. We hope that providing this new street-level imagery on Google Maps can make the memories of the disaster relevant and palpable for future generations. Two years ago we launched an initiative using Street View to digitally archive the 2011 tsunami and earthquake-affected areas in Northeastern Japan. Since then, we’ve captured 360-degree panoramas of the region, including the town of Namie-machi in the Fukushima Exclusion Zone and over 70 interiors of devastated buildings across the Tohoku region.